Congress has legislatively mandated a provision for the limitation of salary for grants, cooperative agreement and contracts for the following agency. …..All HHS operating divisions except the FDA (funded under the USDA appropriations bill) and the Indian Health Service (funded under the Department of Interior appropriations bill). 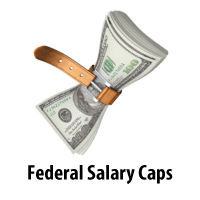 The salary cap summary and time frames associated with existing salary caps can be found at The Office of Extramural Research National Institutes of Health. Clicking on the FY (Year) Awards will give you the Salary Cap Notice for that year and related examples when salary on an award would exceed the salary cap.